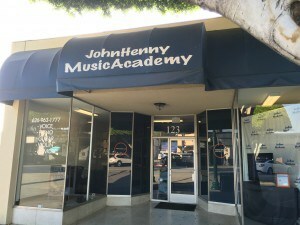 Founded by top Hollywood vocal coach John Henny, the John Henny Music AcademyÂ is dedicated to making music education fun in a state-of-the-art facility.Â We offer voice, piano,Â guitar, violin, drums, saxophone and more.Â We also offer lessons in DJ, songwriting andÂ production and recording.Â We have a full professional stage room, recording studio andÂ video greenscreen.Â All of our lesson studios are soundproofed. Students have performanceÂ opportunities with our daily Sing Zone as well as our monthly Open Mic Nights. Our studentâ€™sÂ success rate is tops in the industry with students appearing on American Idol, Glee,Â Broadway and major record labels.